Ampicillin Sodium is an orally active broad-spectrum antibiotic. Ampicillin is an antibiotic useful for the treatment of a number of bacterial infections. It is a beta-lactam antibiotic that is part of the aminopenicillin family and is roughly equivalent to its successor, amoxicillin in terms of spectrum and level of activity. Belonging to the penicillin group of beta-lactam antibiotics, ampicillin is able to penetrate Gram-positive and some Gram-negative bacteria. It differs from penicillin G, or benzylpenicillin, only by the presence of an amino group. That amino group helps the drug penetrate the outer membrane of Gram-negative bacteria. 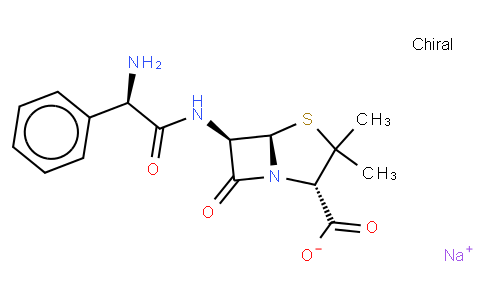 Ampicillin acts as an irreversible inhibitor of the enzyme transpeptidase, which is needed by bacteria to make their cell walls. It inhibits the third and final stage of bacterial cell wall synthesis in binary fission, which ultimately leads to cell lysis. Ampicillin has received FDA approval for its mechanism of action. From Wikipedia.